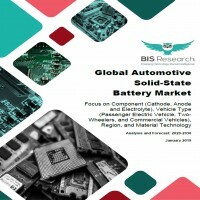 The global automotive solid-state battery market research is conducted with a focus on types of vehicle technology (passenger electric vehicles, two-wheelers, and commercial vehicle), components (cathodes, anode, and electrolyte), and region. The ecosystem is driven by research and innovations originating in countries, such as the U.S., Japan, and the U.K.
• What is automotive solid-state battery technology? • What factors will support the application of solid-state battery in various vehicle types (passenger vehicles, two-wheelers and commercial vehicles)? • How are the material technologies being developed for solid-state battery application on the basis of analysis for the period between 2000 and 2018? • What are the key developments and strategies of the companies in the market? • What is the global forecast for automotive solid-state battery technology for the period between 2020 and 2030? • What is the pattern of supply chain and how are the different players linked? • What is the market forecast for the market by region for the period between 2020 and 2030? • What is the market forecast for the market by vehicle type for the period between 2020 and 2030? • What is the market forecast for the market by component for the period between 2020 and 2030? • What are the key start-ups impacting the solid-state technology development? Material manufacturers form the backbone of the battery manufacturing supply chain. The supply chain can be divided into four categories – raw material, component manufacturer, cell construction, and battery pack development. The end of product life is an important factor, requiring a sustainable method for recycling the EV battery for recharge and reuse or material extraction. The raw material and SSB battery component accounted for over 33% of the total electric vehicle cost based on data points between 2016 and 2018. The development of EV has led to the development of new opportunities and businesses due to the requirement of unique components and service infrastructure. The timeline is based on mass volume penetration of SSB-based EV models in the industry. However, in the initial phase of development, the solid-state technology is estimated to have high cost varying in the range of ~$800/kWh to ~$400kWh by the year 2026. At this level, the solid-state technology is expected to be applicable in premium vehicles, supercars, and luxury cars, as they can easily accommodate such technology in their expansive cost bracket. Between 2022 and 2026, an initial market penetration is expected in the passenger EV market as deducted from various market strategies, such as funding, investments, partnerships, and collaboration taking place in the solid-state battery ecosystem.